Julie Moss is a qualified Canine Behaviourist, TTouch Practitioner and Veterinary Physiotherapist and for the last sixteen years has been on a path of near constant studying and gathering of skills and experience to further her work with animals. This path began in 2002 with the arrival of a particularly trying puppy into her home when she was still a novice dog owner. Cassie was a huge challenge for her and so began a long and winding quest for knowledge and answers. Along the way she received a mix of useful and not so helpful advice from various sources. Julie realised Cassie’s diet was a huge part of her problem, finally found a good training class and things started to come together. Life with Cassie was the ‘unofficial’ side of her canine behaviour education but via much trial and error and many false starts, it led her to many people and places where she found the answers to all her problems and it gave her first hand experience of dealing with many behaviour issues and how confusing it can be for an owner. Cassie the genius rogue puppy! Julie began her ‘official’ studies at Myerscough college for three years where she gained her BSc. Hons in Animal Behaviour and Welfare in 2005. At the same time, in order to gain hands-on experience, she was assisting weekly at the local animal shelter, working at the local vets in various roles and studying Canine Studies at City and Guilds level also at Myerscough. Julie also got Cassie to her Gold Kennel Club Good Citizen award, which is something she never would have thought possible when she first arrived in her life. It was a very intense 3 years of learning! In 2005 Julie then set up Best Behaviour and began officially seeing clients for behaviour consultations. Having personal experience really helps her identify with what people are experiencing and how steep a learning curve it can be when you have a dog who is a challenge. At that point you don’t need to be judged, you just need to be helped. Although she gained lots of theoretical experience from studying for her degree Julie felt she was still lacking in some practical experience and she felt there was a lot missing from her education so far. Cassie was doing well in many ways but she was always a ‘special’ dog and there were things about her she needed more help with. Julie was drawn to the Tellington TTouch work and after attending a workshop she began the practitioner training, which she completed in 2007. Of all the methods and techniques she has learned over the last decade, this one is by far the most versatile and effective and underpins all aspects of her work with animals. It taught her how to really look at dogs and see the small signals which lead you to understand how they feel. This had been sadly lacking in any study she had done this far. Julie also learned many simple yet hugely effective ways of changing behaviour using these techniques. The TTouch work involved lots of observing of dog posture and movement with regards to its effect on behaviour. As Julie started to look more and more closely she was then drawn to physiotherapy training to give her a deeper knowledge of the musculoskeletal system and how it affects dogs. This led her to study for a Diploma in Animal Physiotherapy at The College of Animal Physiotherapy, which she completed in 2011 and a Diploma in Aqua and Hydrotherapy at K9 Hydro Services completed in 2010. She then completed a further Advanced Certificate in Veterinary Physiotherapy at CEPT and qualified as a Veterinary Physiotherapist in 2013. These skills came in very useful when she adopted Fizzie from a local rescue centre in 2011. Fizzie came with elbow dysplasia and needed a comfortable home with lots of therapy readily available! Fizzie has taught Julie so much about supporting older dogs with arthritis and neurological problems, which has now become her passion in life. 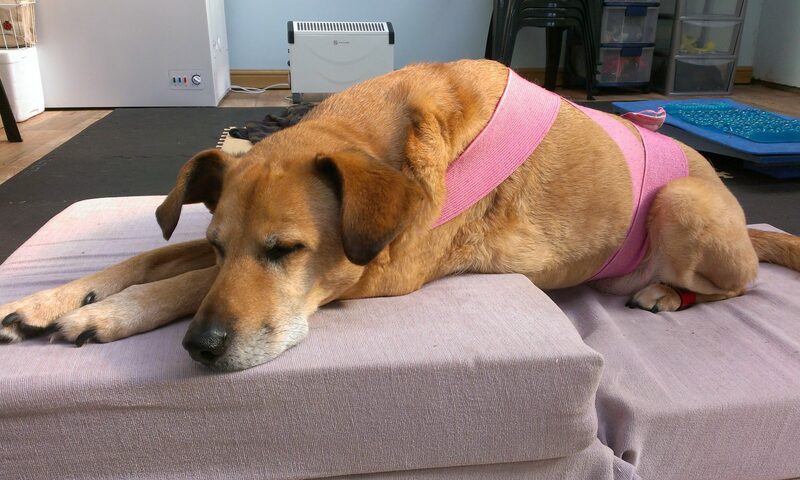 She realised how many older animals can be greatly helped through their later years with physiotherapy and other complementary therapies and yet this is rarely offered to owners as an option. Since 2005 Julie has been keeping very busy both working with clients and studying to broaden her skills and experience range. In 2015 she opened her training centre and began doing workshops and in-clinic physiotherapy sessions. She set up a four week Puppy Life Skills and Socialisation class and continues to teach Puppy Socialisation classes here at the centre after teaching them for Shuttleworth Veterinary Group since 2003/4. Julie has taught TTouch workshops for physiotherapists and writes articles for Healthful Dog Journalzine. In 2015 Ollie the cat came to live with her. He was estimated to be around 14 years old and was brought into the vets looking very unwell. As an elderly cat with health issues he wasnt going to find a home easily and the only other option was to put him to sleep. However, after a dental, healthy food and supportive therapy he began to enjoy life again. Another great teacher to discover how older cats can be helped greatly too. Ollie had a variety of health issues but with the right support and management he went on to live a further contented 2 years. He was a pleasure to live with and benefited greatly from TTouch work and homeopathy. In June 2016 Jake came to live with Julie, Fizzie and Ollie. He has been a long term rescue dog with failed rehoming attempts due to behavioural probems. It took 8 years to discover that the reason for this was the severe hip dysplasia he was struggling with. This was the reason he was growling in certain situations when he found things difficult or painful. However, this was mistaken for unprovoked aggression. Jake is a challenge as he has had years of being misunderstood and in pain and expects close interactions with people to go badly. He is also very sound sensitive and has a fear of the noise of rain and hail and bangs. Despite this he is sociable and does like people as long as they stay hands-off with him. He is a work in progress and yet another great teacher. It is because of dogs like Fizzie and Jake and so many others that in 2018 the Best Behaviour centre needed a change of focus and direction. Many dogs need a combination of the right therapies and vet care to give them the complete support system they and their guardians need and so Canine Mind and Body Balance was born. The aim is to bring together a variety of therapists to work together in any combination to give a complete treatment and support system for any dogs needs throughout their entire life. This gives continuity of care and enables an overlap as everyone understands the complete picture of the dogs life and treatment so far and can add to that process whatever they feel they need. At the moment, Julie is in the process of updating her hydrotherapy qualification by studying to Level 5 at K9HS. She is also starting to offer a variety of treatments by other therapists to add extra layers to the behavioural, TTouch and physical therapy already available. She is also bringing many inspirational people to the North West to teach and inspire both owners and fellow trainers/therapists via workshops and seminars. The aim is to bring attention to all things which enable animals and their people to lead happy and contented lives together and to show them the many not so well known ways to achieve this. There are many options out there and yet we are only offered a handful of old traditional ones. Julie believes people should know all the options and make a considered choice for their animals as a result of that. Times are changing and so should the way we think and choose.